The Chapin Hand-held sprayer is easy to maneuver and is perfect for a wide variety of tasks, such as spraying gardens, bushes, and weeds. Multi-purpose sprayer for the home and garden. Unscrew pump assembly from container and fill container to desired level. Then screw (fasten) pump assembly firmly to the container to provide an air-tight seal. Pump sufficient times to pressurize container (15 to 25 strokes). Spray by pressing trigger. Adjust nozzle by turning to provide desired mist, spray, or solid stream pattern. Periodically apply a few drops of oil down pump rod hole. 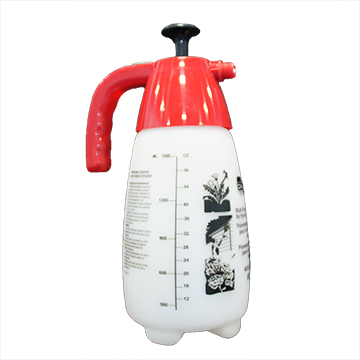 Do not use with solvents and petroleum distillate's that affect plastics. This sprayer is not recommended for use with acid or flammable liquids. Always wear protective googles and clothing when spraying.